A Burrito is typically a flour, corn or wheat tortilla rolled with various fillings inside – black beans, refried beans, grilled or sautéed vegetables, cheese, salsa, lettuce,guacamole and/or meat. This afternoon I was in the mood for some Mexican flavors and made myself a five layered burrito with the ingredients I had on hand. Healthy and packed with flavor, these burritos got me through a very productive afternoon. The five layers – Cilantro Rice, Sauteed Onions and Peppers, Fresh Tomatoes, Spicy Black beans and Corn and topped with Mexican blend cheese. I made three of the layers using the same pan. Less time for clean up. Heat oil in a pan. Add the chopped jalapeno, onions and peppers. Saute till veggies are almost done, with a slight crunch. Transfer to a bowl. In the same pan add the cooked rice and chopped cilantro. The rice picks up the flavors of the veggies from the pan. Cook till the rice is heated through, season with salt and transfer to another bowl. Return pan to heat, add the drained black beans and corn along with the cumin powder and hot sauce. Stir to combine and cook on medium heat until the liquid is evaporated and the beans are coated, about 3-4 minutes. Season with salt. Turn off heat and let beans cool slightly. Assemble the burrito: Warm the tortillas in the microwave or on a pan until soft and pliable. Spread a few tablespoons of rice in the centre of the tortilla. Top with the sautéed veggies, beans and corn, fresh chopped tomatoes and lastly the cheese. 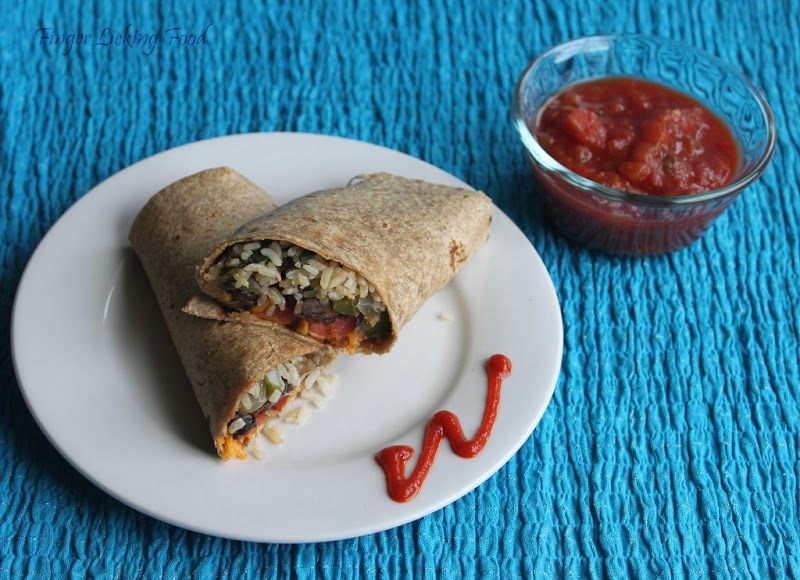 Starting with the end towards you, fold tortilla over the fillings and roll tightly to form a burrito. Slice in half and serve with salsa or a dollop of sour cream. I love burritos, which is very healthy and tastes soo good. 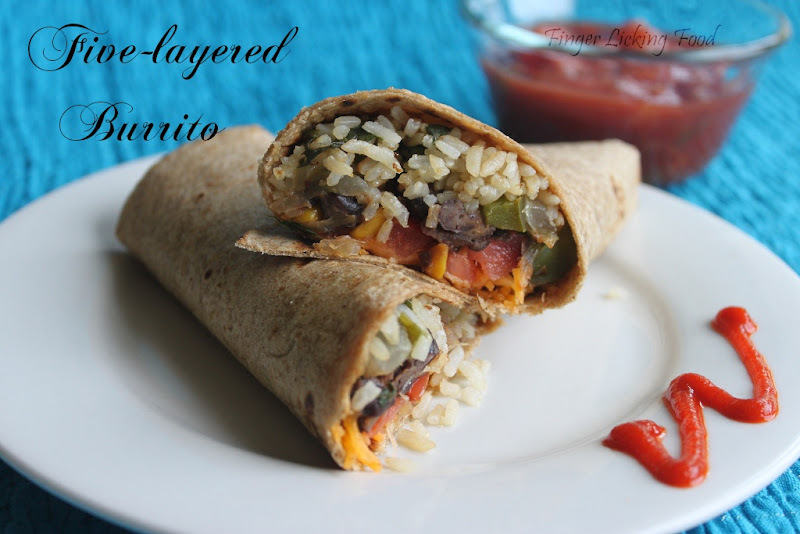 Love your five layered burritos. And some jalapenos in them will make it spicy and delicious. 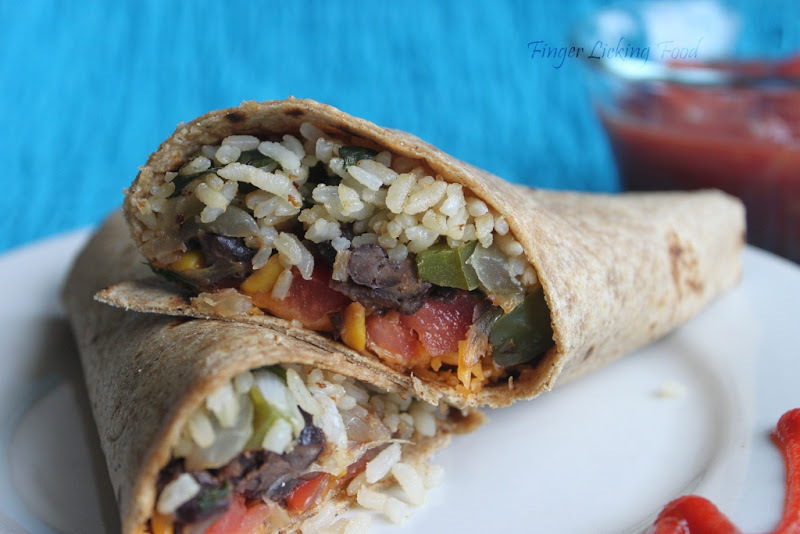 These burritos would make a perfect meal, so healthy and flavourful. Loved it!! Also made your moong dal chila. Came out perfectly.